Don't let the asparagus scare you off. 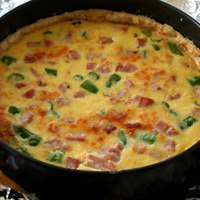 This quiche is delicious! 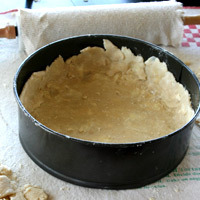 To form in a springform pan, follow the same directions as for a pie pan. Using a pizza cutter trim the excess around the top. The sides should be about 2 inches high all the way around. Cover and refrigerate until ready to use. Stays good refrigerated 2-3 days. Good in the freezer 4-6 months. Heat oven to 425. Bring a medium pot of water to a boil. Rinse and dry asparagus. Take one stalk holding it by the ends. Bend until it breaks. Line up the rest of the asparagus. 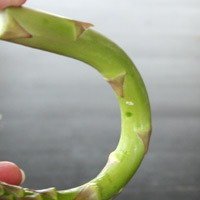 Trim the bottom off of the rest of the stems using the broken stem as a guide. Discard the ends. Cut the remaining asparagus into 1/2 inch or so pieces. The best flavor is at the top. The woody bottom can be tough and flavorless, so it's good to cut it off. Each asparagus bunch is usually similar in where they break, so it's not necessary to break each piece just cut them the same length. Prepare an ice bath in a medium bowl. To the boiling water add 2 t salt and chopped asparagus. Boil 1-2 minutes, just until the asparagus brightens in color. 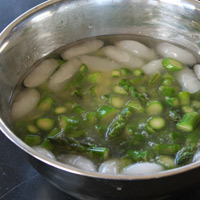 Drain water and place asparagus in an ice bath for a few minutes. Drain and place asparagus on paper towels to dry. 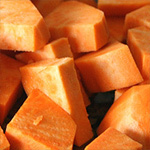 An ice bath is a great way to prevent vegetables from over-cooking. Prepare one by placing 1-2 c ice in a medium bowl. Add enough cold water to fill the bowl half way. Boiling, using and ice bath and drying the asparagus may seem tedious, but it's worth the work. Uncooked asparagus releases a lot of liquid into the quiche and it won't set up properly. 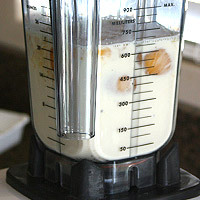 In a blender add eggs, evaporated milk, white pepper and garlic powder. Blend on low until combined. Remove pie crust from the refrigerator. Evenly spread the cheese on the bottom. Layer the asparagus on top of the cheese. Layer the ham on top of this. Pour egg mixture over the top. Shield the edges of the crust. Bake 30 minutes. Remove shield and bake another 10-15 minutes or until done. Remove from oven and place on a cooling rack. Cool 10 minutes. If using a springform pan slide a knife around the edges and remove the side of the pan. Serve hot or at room temperature. It is important to shield the edges of the crust so they don't burn. Pie shields can be purchased, but aluminum foil works great as well. Set a piece of foil under the pie pan. Trace a circle a little wider than the top of the pan. Cut out the circle. Cut another circle in the middle of this, leaving about an inch all the way around. Place on top of the pie and bake. 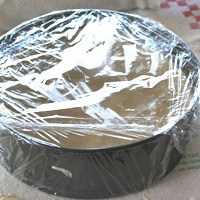 Don't wrap the foil around the bottom of the pan or the crust will be soggy. If it feels liquidy bake it longer. If it springs back gently, it is just right. If it is very firm it is over-done. 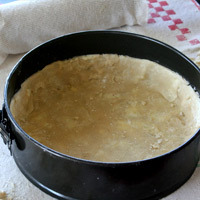 Pie crust- see Perfect Pie Crust for problems with this. 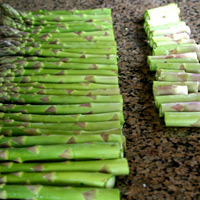 Asparagus- be sure to follow the directions for boiling, cooling and drying the asparagus. If this step is skipped the quiche will not set up properly. 1. Measure the water and set aside in freezer. In a large bowl measure the (1)flour and salt. Stir well to break up any flour clumps. Set aside. 2. Measure the shortening then cut the butter into 1-2 T pieces. Using a pastry cutter, cut the shortening and butter into the flour mixture until pea-sized. Do not (2)over or under-mix this. Pour the cold water evenly on top of the mixture. Stir gently until just moistened. Set on the work surface and push gently together to form a rough ball. It will be crumbly, but this is correct. 3. Roll out to desired size. Use a pizza cutter to cut off excess and form a circle. Slide a spatula under all sides of the dough to make sure it isn’t sticking. Place the rolling pin a few inches into it and gently lift the dough with a spatula onto the rolling pin. Roll the pin until all of the dough is around it. Lift and place on the side of the springform or pie pan. Gently unroll into pan. Fit the dough into the pan (3)patching up any holes or weak spots. Trim the excess or form it for a decorative look. 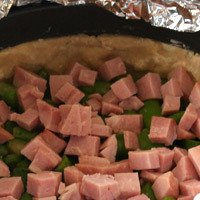 If using a springform pan trim the top with a pizza cutter. The crust should be about 2 inches high all the way around the sides. 4. Cover and refrigerate until ready to use. Stays good refrigerated 2-3 days. Good in the freezer 4-6 months. 1. Heat oven to 425. Bring a medium pot of water to a boil. Rinse and dry asparagus. Take one stalk holding it by the ends. Bend until it (4)breaks. Line up the rest of the asparagus. Trim the bottom off of the rest of the stems using the broken stem as a guide. Discard the ends. 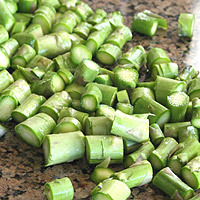 Cut the remaining asparagus into 1/2 inch or so pieces. 2. Prepare an (5)ice bath in a medium bowl. To the boiling water add 2 t salt and chopped asparagus. Boil 1-2 minutes, just until the asparagus brightens in color. 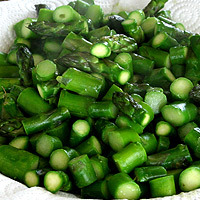 Drain water and place asparagus in an ice bath for a few minutes. 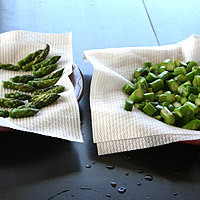 Drain and place asparagus on paper towels to (6)dry. 3. In a blender add eggs, evaporated milk, white pepper and garlic powder. Blend on low until combined. 4. Remove pie crust from the refrigerator. Evenly spread the cheese on the bottom. 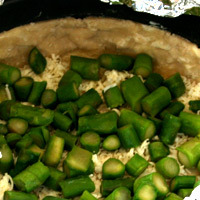 Layer the asparagus on top of the cheese. Layer the ham on top of this. Pour egg mixture over the top. Shield the (7)edges of the crust. Bake 30 minutes. Remove shield and bake another 10-15 minutes or until done. Test by gently (8)touching the middle of the quiche. 5. Remove from oven and place on a cooling rack. Cool 10 minutes. If using a springform pan slide a knife around the edges and remove the side of the pan. Serve hot or at room temperature. 1. 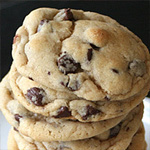 If sifting the flour use 1 c + 1 T. If not sifting, use 1 c - 1 T. Sifting then measuring will bring the most accurate results. 2. 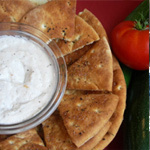 If the crust is under-mixed the ingredients will not be distributed evenly. In a properly mixed dough you will have spots of butter, but not huge chunks. If it is over-mixed it will make the dough tough. 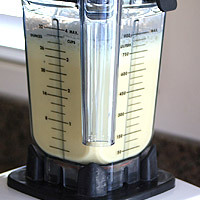 Also the friction of mixing will soften the butter too much. 3. 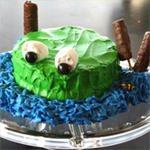 It is important to patch any holes or weak spots so the filling won't leak through. However, try to touch the dough as little as possible to prevent the butter from melting. 4. The best flavor is at the top of the asparagus. The woody bottom can be tough and flavorless, so it's good to cut it off. Each asparagus bunch is usually similar in where they break, so it's not necessary to break each piece just cut them the same length. 5. An ice bath is a great way to prevent vegetables from over-cooking. Prepare one by placing 1-2 c ice in a medium bowl. Add enough cold water to fill the bowl half way. 6. Boiling, using and ice bath and drying the asparagus may seem like a tedious process, but it's worth the work. Uncooked asparagus releases a lot of liquid into the quiche and it won't set up properly. 7. It is important to shield the edges of the crust so they don't burn. Pie shields can be purchased, but aluminum foil works great as well. Set a piece of foil under the pie pan. Trace a circle a little wider than the top of the pan. Cut out the circle. Cut another circle in the middle of this, leaving about an inch all the way around. Place on top of the pie and bake. 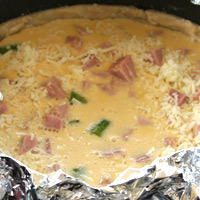 Don't wrap the foil around the bottom of the pan or the crust will be soggy. 8. If it feels liquidy bake it longer. If it springs back gently, it is just right. If it is very firm it is over-done.